Hi Guys and Happy Wednesday! After reviewing your poll on Instagram it was pretty 50/50 on what you wanted to see in regards to my Portland Itinerary and a personal post, so I figured I would cover both! 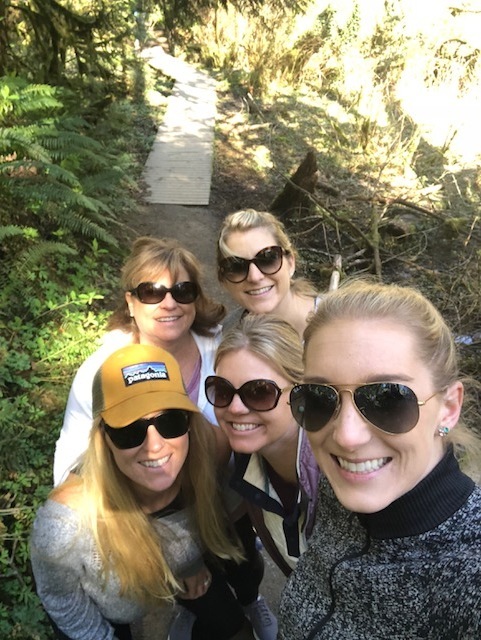 As most of you know, my sisters and mom and I recently went on a girls’ trip to Portland. We started this trend a couple of years ago after we began realizing how difficult it was to really get to spend time connecting with the hustle-bustle of life. We initially just planned on doing local places and sort of decided together where we would go for our trip, but with all of us having been so many different places back home and having opinions of our own, we decided that this year we would begin with one of us choosing the location (flight and hotel had to be no more than $500) and that one person would get to plan the trip. Well, guess who got to plan this year??? ME! 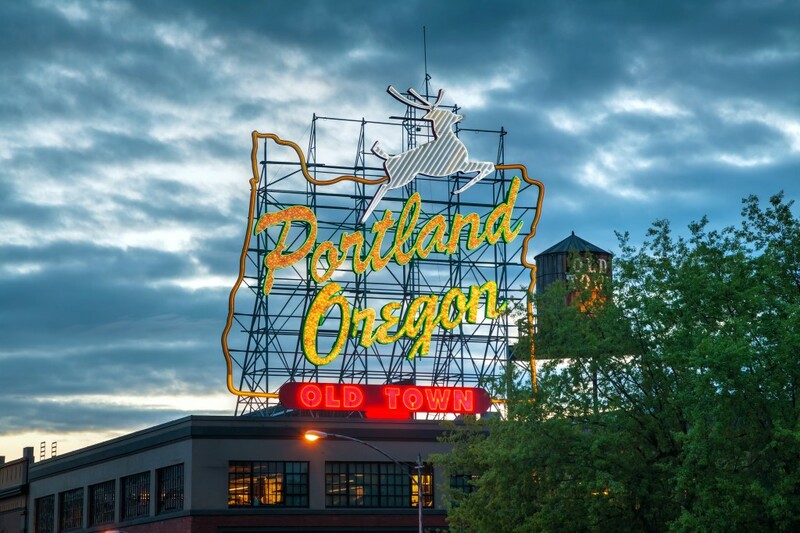 After looking at my options (I did only get a couple months notice so airfare was a little difficult), I landed on Portland. I wanted somewhere that was beautiful, would have lots of activity options, was a place I had never been before, and was great on airfare! It worked out perfectly too, because it turned out none of us had been there before, but all wanted to go! So, let’s get into the details! I knew we wanted to be close to downtown, but I also wanted something with lots of things close by. 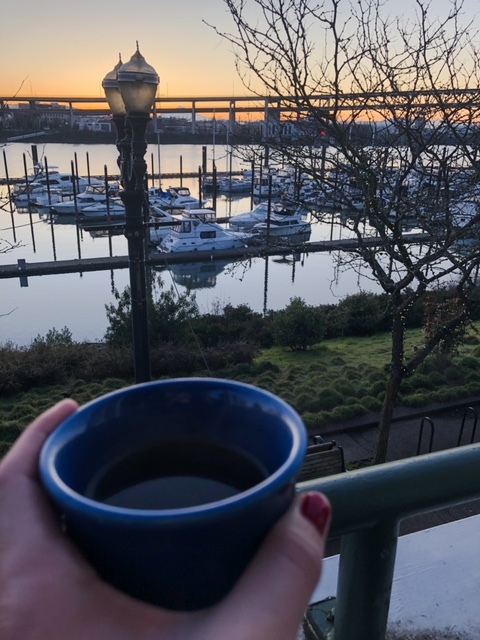 We tend to like to take walks in the early mornings with our coffee, so when I saw that Portland had a great riverwalk, I knew I wanted something close to that. The last requirement is typically finding a room that is not $5k, but big enough for five – because let’s remember folks – we are sisters for crying out loud. Enter Kimpton RiverPlace Hotel. This hotel was absolute perfection. To start, the staff was friendly, helpful, and always on top of everything. That alone can make or break a hotel experience for me and the Kimpton definitely earned a five star rating from me. Next, they had a beautiful room option for us that included two bedrooms, two bathrooms, living room, dining room, and full kitchen. There was a king bed, a queen bed, a trundle, and a pullout couch! We all fit perfectly with no problems. In fact, it was almost too nice because instead of wanting to explore, we all just wanted to relax in our room. Add in our river view, beautiful terrace and comfy robes, and I was swooned! Us Muntzel women know how to find good food and it definitely wasn’t difficult in Portland. As my Uber driver said, “If you leave Portland hungry or thirsty, then you are doing it wrong.” Haha! For brunch on Friday and Saturday, we ate at two amazing places. Friday we ate at Mother’s Bistro & Bar, which was perfect because it was within walking distance from our hotel. The food (and the bloody Mary’s) were amazing! We all tried something different and to be honest I don’t think you can wrong. If I had to choose, my favorite was definitely the biscuit breakfast (insert drooling emoji haha). Saturday we ate at another delicious option, called Jam on Hawkins. We did have to wait here for some time (they don’t take reservations), but the food, ambience, and service was great and well worth it. Plus, you can get hot coffee with all the fixings while you wait, making everything better! I believe the favorite here was the breakfast burrito and lemon ricotta pancakes. Despite both of these though, I think my absolute favorite breakfast was from a local coffee shop called Upstream by our hotel. We ended up here when we decided to make things easy the day we were left and just pick up some coffee and things to share. From the mocha latte to the three different types of “toast” we picked up, I was in heaven. Think thick soft bread layered with a delicious cheese spread, honey, and lavender sprinkled on top. Omg! So good! Next up, is our two dinner spots. 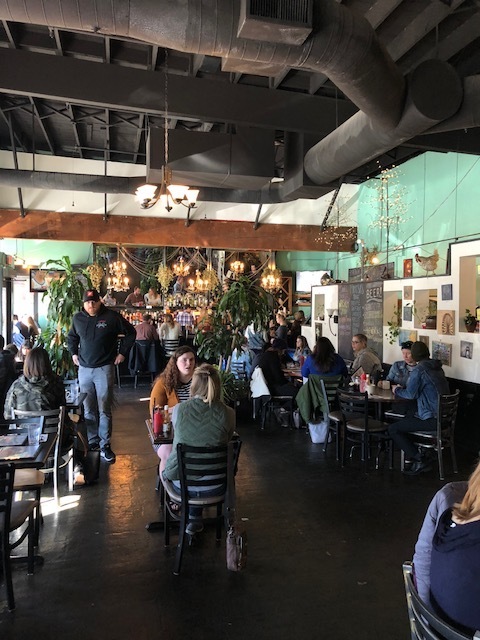 Friday we went to a casual restaurant located in the Pearl District (which is where you can find some of the best shopping) called Deschute’s Brewery. Not only was the local beer availability abundant, but the food was delish (As a side note for my beer lovers, this brewery is included in Portland’s “brewery block” where you have the option of essentially hoping from one brewery to the next). I ordered their Mac n cheese and it will probably go down as my favorite Mac n cheese ever….so I think that’s saying a lot. Saturday, we almost didn’t make it out due to all of our activities, but luckily pulled ourselves together and ate at the bar of McCormick and Schmick’s Harborside Restaurant. This was probably one of my favorite activities so far because we all just ordered something light (their clam chowder is to die for) and basically just laughed until our stomachs hurt about stories and life. It was so fun. If you do plan on eating at this location for dinner, I would suggest making a reservation because it can get pretty busy, but the bar at this location was very big and had plenty of tables to sit at, so it worked out perfectly for us. Lastly, I will share some random food places that you may want to check out…One place that everyone suggested going to was Voodoo Doughnuts, however, when talking with locals from Portland, a lot of them said it was overrated and the lines were too long. As a result they suggested an alternative called Blue Star Doughnuts. We did go here, but to be honest I wasn’t super impressed. In comparison to our Duck Doughnuts here in Charlotte, I didn’t think it worth the stop, but that’s just me, so maybe Voodoo would be a better option. Also, if you are a food truck person, Portland will be your jam because there are little food truck groupings all over the place. We personally did not try any food trucks, but I definitely think I will add it to my list for next time. 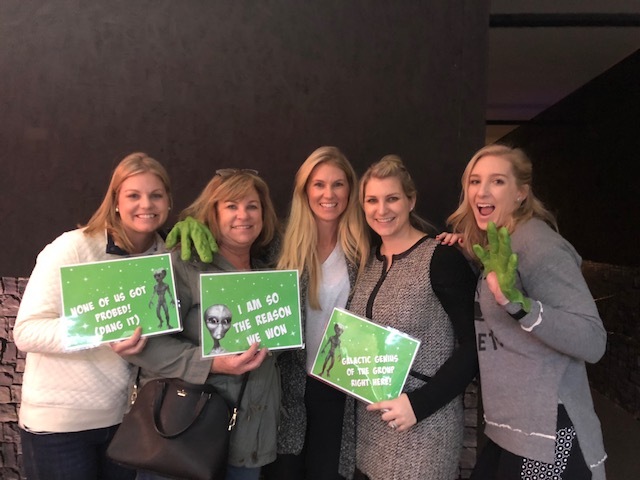 My sisters and mom and I after escaping from our Escape Room! Lastly, and probably most important, is what to do in Portland besides eat (although…eating, drinking, and napping are a few of my favorite things haha). The first day, after we brunched, we all decided to walk through Downtown a bit with our first stop being Powell’s Bookstore. We have numerous avid readers in the family, but one in particular that downs a book like I down coffee, and when you are going to a city that has the biggest new and used bookstore in the WORLD…you better stop, and I am glad we did. I personally picked up quite a few good reads and I don’t think one of us left there empty handed. I would say if you are staying longer than a weekend, this would be a fun place to spend an afternoon because they even have coffee. Unfortunately we did not have a ton of time, so a couple of hours had to suffice. 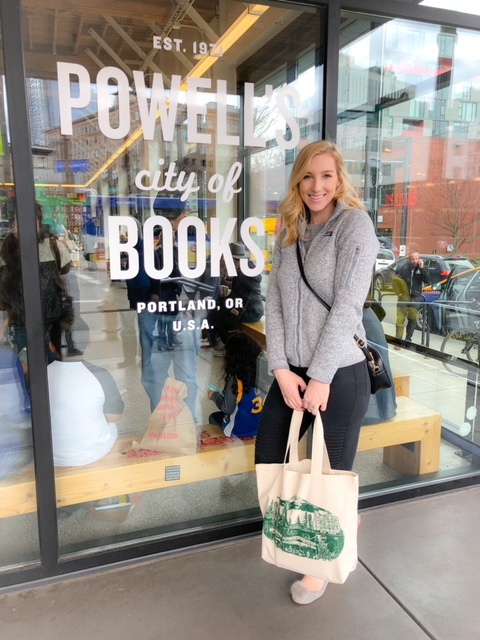 Powell’s is also very well located with a lot of stores surrounding it, so us Muntzel girls did what we do best after the bookstore and hit the pavement with our shopping shoes on! The last thing we did on Friday was sort of unique, but was highly requested from the sisters, so who am I to deny them?? We ended up doing an escape room! If you have never done one, I highly suggest it. I don’t know that Portland is the best place (they are popping up everywhere now), but we had a great time. Plus, we ESCAPED with almost 20 minutes left! Portland did have numerous locations if you feel like this is something you would want to incorporate into your adventures. It was super fun! Saturday, we spent most of our morning relaxing and eating at Jam. This was so nice because we don’t really get to do that very often, especially with my older sisters having two kids of their own. We then decided to walk off our full bellies with a beautiful hike. Hiking is one thing I HIGHLY suggest you do while in Portland. There are numerous locations with beautiful falls that are about 40 minutes out, but we decided to stay fairly close and went to a gorgeous place called Tryon Creek State Park. What I liked about this one was that you could go out as far as you wanted to, but they always had signs leading you back to the main entrance. It would be perfect for families because you could make it as long or short as the kids last haha, or if you don’t have enough time like we did. Some other recommendations would be to go to the Rose or Japanese garden. They are across from each other so you could easily do both if you wanted to. The Rose garden does not bloom year round so if you are there when they are not blooming I was told it is still worth a peak inside because the views from it are beautiful. Another fun option might be the Portland Saturday Market. This market is open March through Christmas Eve, but is the nation’s largest open-air arts market. Lastly, I was told if you have kids (or not!) the Portland Zoo is very fun, as well as the Aerial tram, which allows you to see all of Portland from above. Hope you enjoyed and let me know if you go visit!